Tell Arrowhead Research to Stop Experimenting on Chimpanzees! Thirty-five years ago, a female chimpanzee—identified only as “4X0139″—was intentionally infected with the hepatitis B virus by experimenters. She was then infected with HIV, hepatitis C, and other illnesses and has been imprisoned in a laboratory for use in traumatic experiments in the decades since. Recently, in an experiment at the notoriousTexas Biomedical Research Institute, she was injected with an experimental hepatitis B drug and then underwent repeated painful biopsies, during which pieces of her liver were removed. 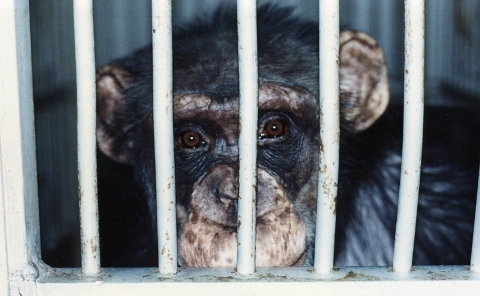 This experiment was commissioned by pharmaceutical company Arrowhead Research Corporation, even though a landmark report on the scientific validity of experiments on chimpanzees concluded that “most current biomedical research use of chimpanzees is not necessary,” including for hepatitis B research. Many drug companies—including Merck, GlaxoSmithKline, Gilead Sciences, and Novo Nordisk—have pledged to stop performing these unethical and archaic experiments on chimpanzees. PETA has repeatedly asked Arrowhead to make the same commitment, but the company has failed to act. Please take a moment and politely ask Arrowhead to join these companies by pledging not to fund, commission, or conduct experiments on chimpanzees. I can’t. I simply can’t read stuff like this and it makes me feel guilty because I should be able to read it and try to prevent it from a greater knowledge of the subject. I don’t want greater knowledge of the subject what use is that? I WANT ALL EXPERIMENTS ON ANIMALS TO STOP. JUST STOP DOING IT! With some things on WordPress, a second click toggles it back again. You are correct, it is completely unnecessary.